Technology is a wonderful thing, and the perfect marriage of advanced acoustic engineering and visual impact that acoustic panel printing offers is a great example. There are so many occasions when a quiet environment is helpful or even necessary. In the office, in educational facilities, at a bank, in hospitals or healthcare centres, in meeting areas, at an exhibition or gallery, sports halls, nurseries – anywhere, in fact, where it might be necessary to create a quiet environment or have a confidential or discreet conversation without closed doors or structural divides. That’s where EcoPhon Akusto™ graphic walls or screens come in, greatly reducing noise, increasing speech clarity and minimising sound propagation. Sounds strange, we know, but they really do work, and are becoming increasingly popular for all sorts of different, busy environments. The design possibilities are endless, and every graphic can be personalised to suit your taste or brand. They are also easy to install, making them a popular choice for refurbishments, renovations or adding colour or style. At just 40mm thick, panels can be mounted on almost any surface and come with a range of hanging and mounting materials for simple installation. RBS needed to solve a problem: how could they offer their customers the privacy they needed when discussing private financial matters, while maintaining an open plan branch design where doors were usually not an option. 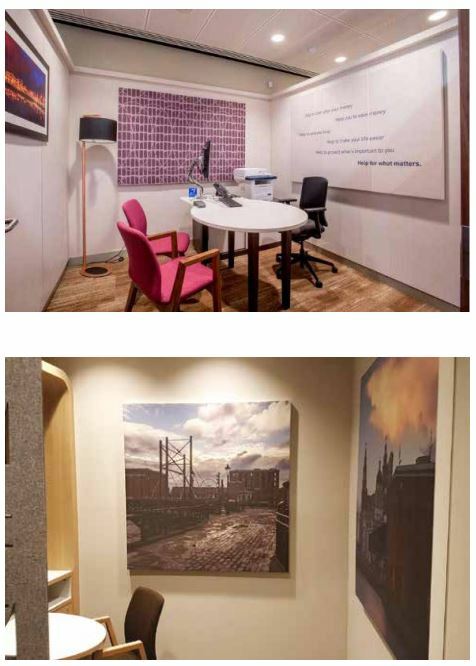 We supplied them with Ecophon Akusto™ panels, printed with Pantone-specific brand colours and designs to fit seamlessly with their interior design aesthetic, adding style and colour while simultaneously creating quiet areas which prevented conversations from being easily overheard. Installation was carried out overnight so as not to disrupt customers’ use of the branch, and our expert fitters advised on the best positioning to optimise the acoustic effects of the panels. 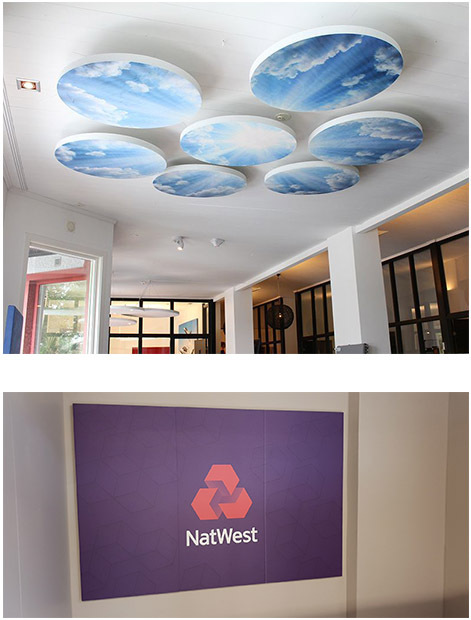 RBS were delighted with the results and have rolled out the panels to a number of their branches nationwide.